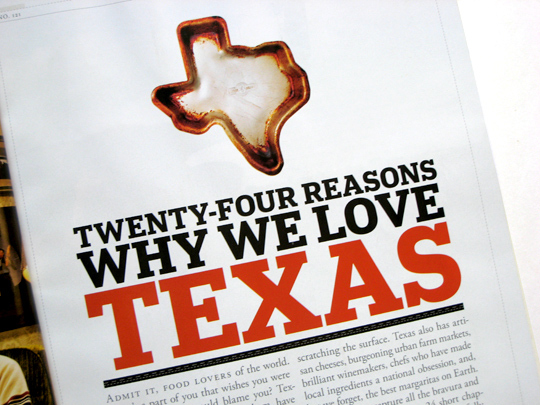 Love it or hate it, there's something about Texan food. Not quite Southern, not quite Southwestern, and not quite Mexican, Texan cuisine is something else entirely. 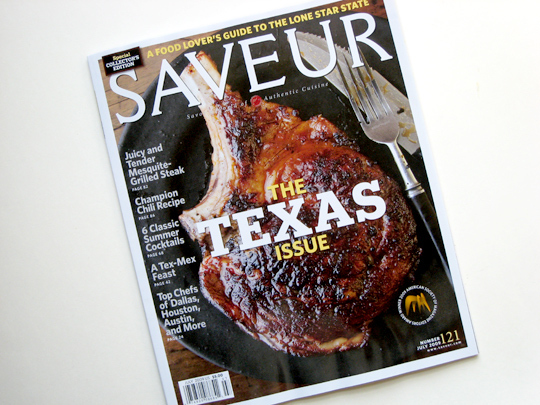 Saveur's June/July issue is largely comprised of a collection of pieces of varying length entitled "Twenty-Four Reasons Why We Love Texas." 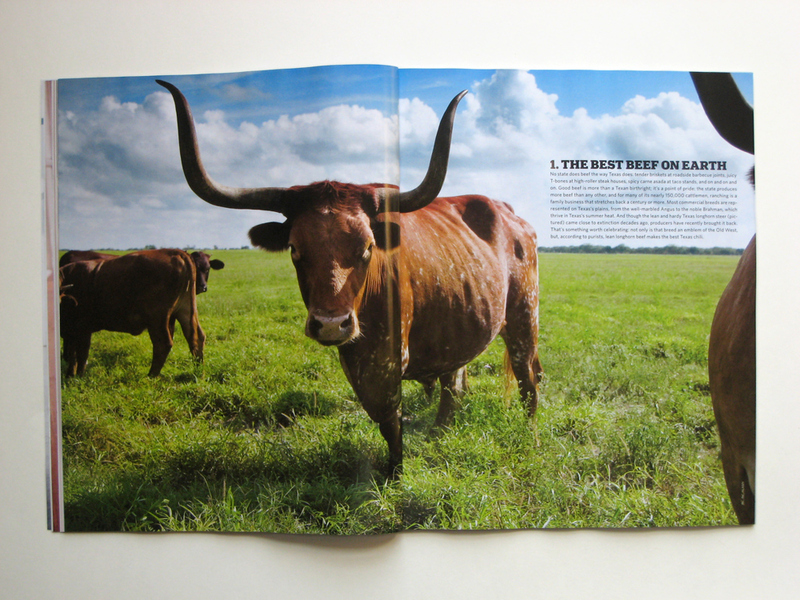 In this "Texas issue," Saveur does a fairly good job of covering what is by definition a very big topic. 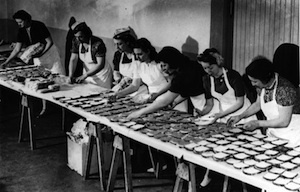 While there's always going to be some debate when it comes to regional cuisine, the team here does a pretty nice, if basic, job of covering the main points. You could argue Austin's not in there enough, you could argue that San Antonio is barely covered, but the fact is that Texas is huge, and something's always going to get left out. What the issue does well is acknowledging the rural areas; small town barbecue, chicken fried steak, cooking over an open fire, it's in there. 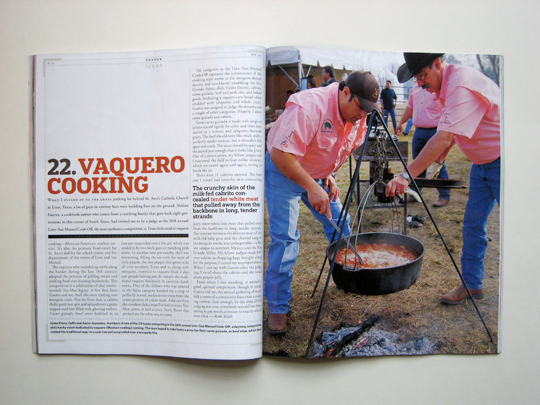 There are many contributions by Texan natives, including a piece by Robb Walsh ("Vaquero Cooking") and photography by Penny de los Santos. These local voices go a long way to give the issue its authentic vibe. 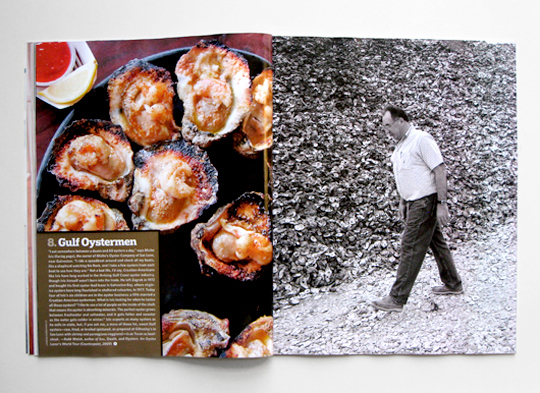 Gulf Oystermen harvesting the creamy, gigantic oysters Texas is (in)famous for. 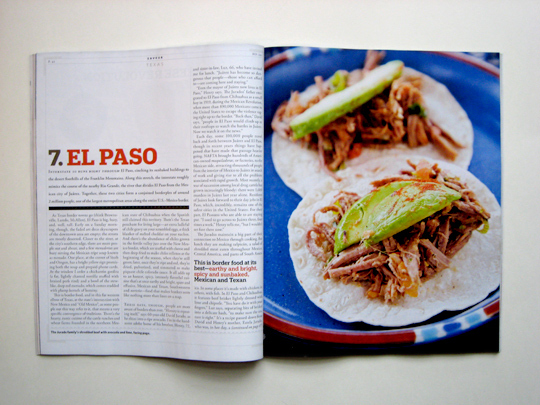 Bordertown El Paso has its own take on Texas cuisine--just don't call it Tex-Mex. 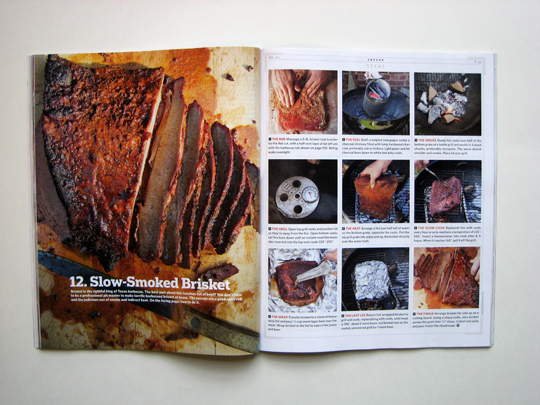 Texas-style barbecue includes sausage and chicken, but they're famous for Slow-Smoked Brisket. 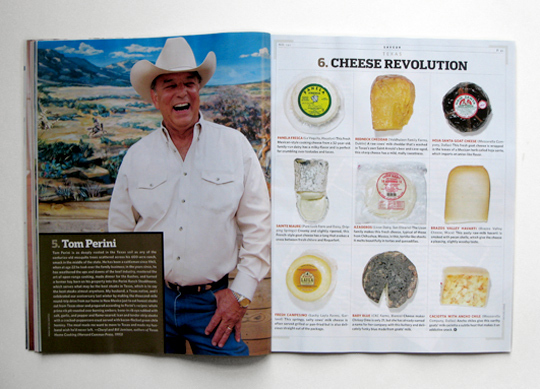 Some of our other favorites include a piece on a cheese revolution going on, with many boutique cheese makers taking advantage of the other tasty product to come from cows (and goats, and sheep); a story on New Zion Barbecue, a church in Huntsville Texas that makes some of the best barbecue around; a lengthy piece on Stephen Pyles, who put Southwestern cuisine on the map in the 80s — he also created the tamale tart, a masa-crusted garlic custard tart topped with crab that we're dying to try; via tattoos, Home-State Pride, which Texans definitely need more of.